Make framed pictures, pendants and more. Read on to discover 10 easy but gorgeous 3D craft projects that you can create at home and give as gifts. These make the perfect stocking filler. Either buy ready-made shopping lists with the magnet already attached, or grab some craft magnets from eBay, and use a glue gun to adhere to the back of a flat notebook. Cover in gorgeous Designer Series Paper from Stampin' Up! and there you have it - an inexpensive, on-trend gift with little-to-no effort. You can find inexpensive wooden boxes at most cheap home stores such as B&M or QD Stores. 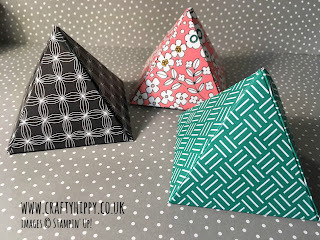 I have left my Embellishment Gift Box plain, and just added patterned paper in the bottom, of course you could stamp or paint yours. I have added ribbon, buttons and handmade embellishments (made using the Lift Me Up stamp set) and filled each compartment. This is perfect for storing ready-to-grab embellishments, or makes a perfect gift for an enthusiastic crafter. You can view the original project HERE. 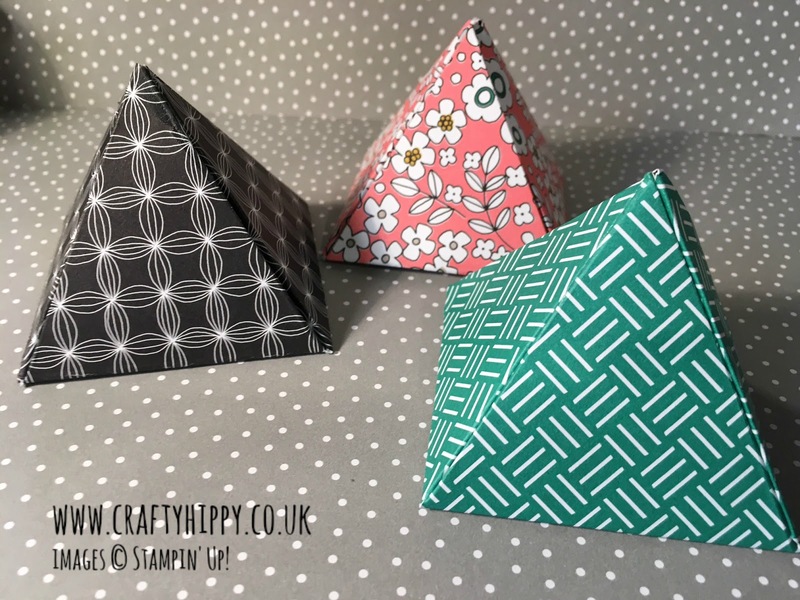 As shown earlier this week, these Pyramid Favours are perfect for parties, Christmas tables, kid's goody bags, weddings, or even as decorated, ornate items on a sideboard. They are simple to make, and you can choose to use any Designer Series Paper that takes your fancy. It is up to you whether you glue these closed, or you can opt for Tied Favours where you tie a bow to close at the top. It is entirely possible to stamp on glass. It takes a bit of practice if you're stamping onto a curved side, but you can do it. I used StazOn Ink which can be used on a variety of different surfaces such as wood, glass and metal, and is available in different colours. Stamp some StazOn ink (from most art shops) onto your glass and fix with an acrylic sealer like Krylon. I used Black Staz On to decorate my vase with plants and bees. If I was to make this project again I'd probably use the Oh So Eclectic Stamp Set as the one I used on this vase is no longer available. Turn an ordinary box of chocolates into a gorgeous, bespoke gift. Jazz up a box of Kinder with this gorgeous Chocolate Box Cover. This is a really quick and simple project to make and doesn't take much planning. The box ties up at the top with a ribbon and is decorated on the front - of course you could decorate the other side and be as elaborate as you like. This project is perfect for goody bags, table gifts and favours. All you need to create stamped candles is tissue paper, greasproof paper and a heat gun. Isn't that amazing? We have a wonderful range of Stamp Sets that are perfect for candle decorating. I call this a 'Scarf Box' because it is perfect for gift-wrapping a floaty chiffon scarf. Of course you could use it to wrap anything that will fit inside. The ribbon keeps the lid securely in place. You can use whatever colours suite your gift. I have actually stamped the bees onto the lid, or you could affix some Designer Series Paper onto some Cardstock. For full instructions on how to make this box click HERE. This is probably the easiest craft project of all. To create this project you need a Big Shot Machine, Woodland Embossing Folder, Aqua Painters, Ink Refills, Early Espresso Classic Stampin' Pad and a Brayer. Oh, and a frame! 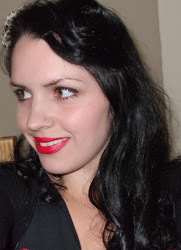 This one cost less than £3.00 from QD Stores - bargain! Of course you could use a different Embossing Folder from our range. Alternatively, you could use a selection of Designer Series Papers instead of embossed card for a striking picture. This would make a perfect gift. It is possible to create beautiful jewellery using a few craft supplies. It is satisfying to create something so simple and different. These pendants are perfect presents - with Christmas approaching they make the perfect stocking filler or Secret Santa gift. 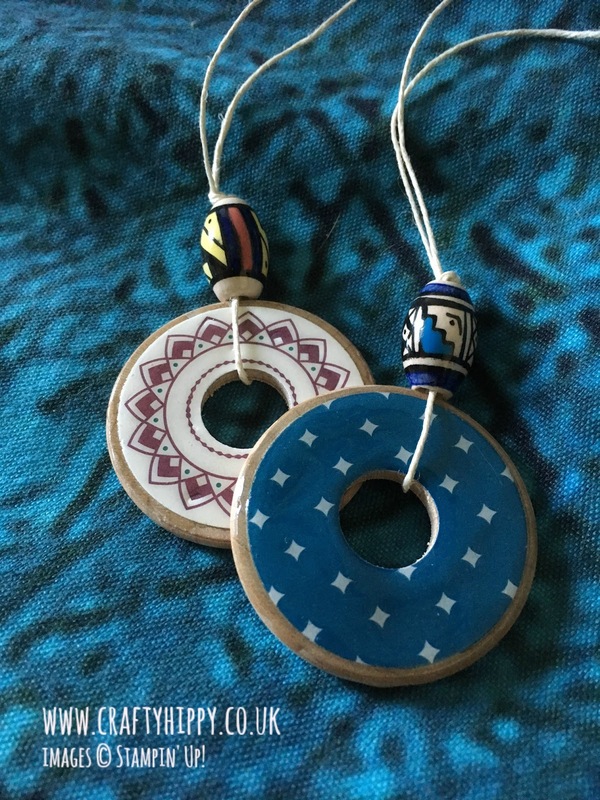 You'll only need a few basic items to make these - wooden washers, beads, patterned papers and some thread or ribbon. Learn how to make these pendants by following the tutorial HERE. This is the perfect gift for you. It might only look like a decorated jam jar, which it is, but it has a very special purpose. This is a jar that you fill with good thoughts, moments and memories that happen throughout the year, so that you can read them back to yourself before the start of a fresh new year. Of course you could start this at any time, but it's so lovely to read them on New Year's Eve and then start afresh with new memories from the 1st of January. You can make your jar as fancy and elaborate as you like, and if you are gifting it you could include a lid. I have used some Designer Series Paper for this project. These projects are all easy, don't need much in the way of craft supplies and don't take much time - perfect. You can buy everything you need except the sundries (candles, jam jars, wooden washers etc) from the Stampin' Up! Store - just use the Shop Now button at the top of my page. Please come back for more Stampin' Up! 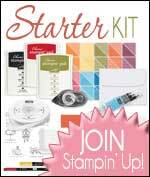 news and ideas, and for more information about becoming a Stampin' Up! Demonstrator in the UK please visit our Join Page.